Kamco Executive Vice President Alan Benien (left center) and Kamco Plant Manager Lisa Woodring (right center) attended the meeting of the West Unity Village Council to give thanks to the community by donating to both the Brady Township Fire Department, represented by Jim Eisel (left) and the West Unity Police Department, represented by Police Chief J.R. Jones (right). Upon the opening of the May 12 village of the West Unity Village Council, Mayor Peg Bernath welcomed representatives from both Kamco and Master Plan Feeds, who were both in attendance to give back to the community. 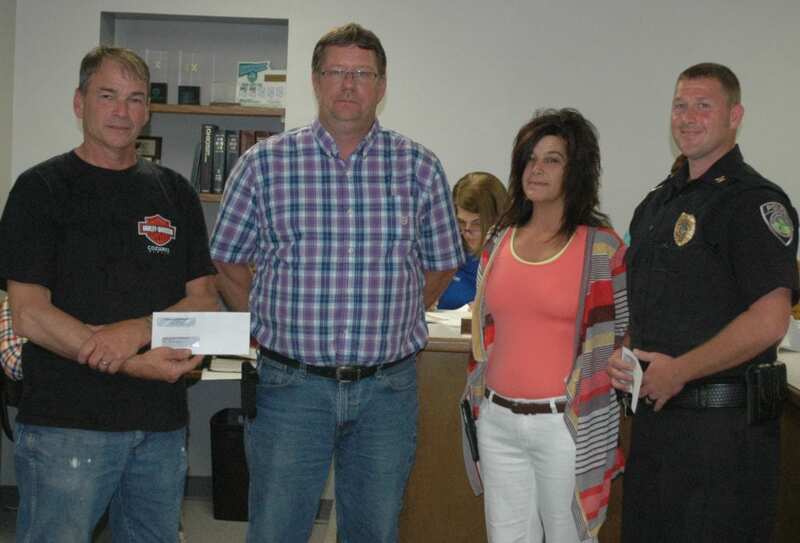 Kamco Plant Manager Lisa Woodring commented that “The community does a lot for us and we would like to do something in return.” That something amounted to checks written to both the West Unity Police Department and the Brady Township Fire Department. The donation to the fire department will go towards new uniforms. Police Chief J.R. Jones explained that the $2500 donation given to the police department will offset the $2985.57 cost of three new tazers and five new holsters that the department has needed to update for some time. Jones also expressed his sincere appreciation of the gift. Timmi Pickett from Master Plan Feeds was in attendance to explain some of the ideas he has that would also allow him to give back to the community. A Farmer’s Market ran by Master Plan Feeds is now in the works and Pickett and council agreed that the best location for this would be at Friendship Park. Pickett also noted that he is working on arrangements with Handyman Hardmare as well as looking forward to a Grand Opening celebration that could include a cook-out, hog roast, a 1K run, and music. Pickett explained that Master Plan Feeds is committed to returning to healthy living and would like to promote a day of that during the Grand Opening. The celebration is currently only in the discussion stages. Council did, however, agree that Wabash Park may be used for such an event as long as proper reservation paperwork is filled out. The third reading of Ordinance 2016-2-R, An Ordinance Establishing the Ranges and Rates of Pay of Certain Officers and Employees of the Village of West Unity, Ohio. The ordinance passed unanimously and will go into effect in 30 days. The first reading of Ordinance 2016-4, An Ordinance adding Section 337.32 to the Codified Ordinances of the Village of West Unity, Ohio. The ordinance pertains to the use of engine brakes within the village limits and passed unanimously on first reading. The third reading of Resolution 2-2016-3R, A Resolution Adopting the Village of West Unity Personnel Policies and Procedures Manual as Amended and Adopted June, 2016. The resolution passed unanimously and will go into effect in 30 days. He has been working on filling out a Mosquito Control grant but gathering information from the Ohio Department of Health regarding the grant has been slow. The fourth grade students visited the water and waste water plant and both he and Jim Eisel enjoyed talking to the students and answering their questions. He attended a class held by Master Meter and learned about new products and software the company now provides. The village’s current meter products and software have become outdated and will need to be upgraded in the future. The total cost of such an upgrade is estimated at around $21,000. A meeting was held between Fritsch, Mayor Bernath, Fiscal Officer Kim Grime, Street Supervisor Jim Eisel, and Lee Rausch pertaining to the drawing for the Wabash shelter house and the Jackson Street Water line. Rausch is going to send a quote for bid assistance and administrative costs for the shelter house. These costs, approximately $4250, were not included in the original scope. New tennis nets have been put up. A resident requested that a steel post be put into his yard to prevent semis from pulling through his yard and is happy to report that the measure has worked. Ecoli readings have gone down from 161 to “too low to measure” to 14.6. This is a great improvement over former readings. Fiscal Officer Kim Grime noted that she will be attending training in the upcoming months and thanked the council for allowing her to apply for the scholarships to do so. She also noted that Income Tax collection is up 8% from 2015. Mayor Peg Bernath and several of the council members gave thanks to all of those that committed their time and energies to the recent Tree City U.S.A. awards that were held in West Unity. The event turned out beautifully and all of those involved should be proud of their efforts. The next meeting of the West Unity Village Council will be held on Thursday, June 9 at 7:00 PM in council chambers. Be the first to comment on "West Unity Businesses Give Back To The Community"